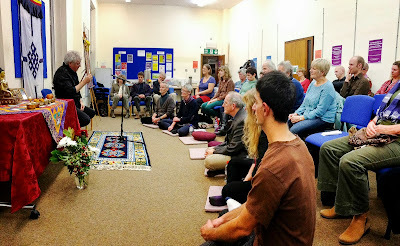 Lama Jampa Thaye visited Exeter on October 10 to mark 30 years of Sakya Thinley Namgyal Ling. The Exeter group was established in 1983 by Martin Samuel and Paul Rogers and has been fortunate to receive visits from Lama Jampa and other eminent Sakya Lamas such as HH Sakya Trizin and Phende Rinpoche. Lama Jampa gave a well attended teaching to Dechen sangha from across the UK as well as people from other local Buddhist groups including Diamond Way, White Lotus and Theravadan sanghas. Entitled ‘Mind training for everyday life’ the talk was based on a teaching from the lineage of Atisha, who revitalised Buddhism in Tibet in the 11th century. Lama Jampa began by stressing that the existence of different traditions of Buddhism was a cause for rejoicing and that we should hold, “in our hearts a sense of the uniqueness and preciousness of the different types of Buddhism because they have all stemmed from the extraordinary genius of the Buddha’s mind.” He then continued with a precise summary of Atisha’s Seven Point Mind Training with great clarity and humour, presenting the essence of Bodhicitta, the central aspect of Mahayana Buddhism. Lama Jampa explained how mind training teachings (lojong) such as the Seven Points, are particularly effective for the practitioner because they distill the essence of the whole of Lord Buddha’s teaching - morality, meditation and wisdom (the three trainings) - into short, pithy, practical instructions.